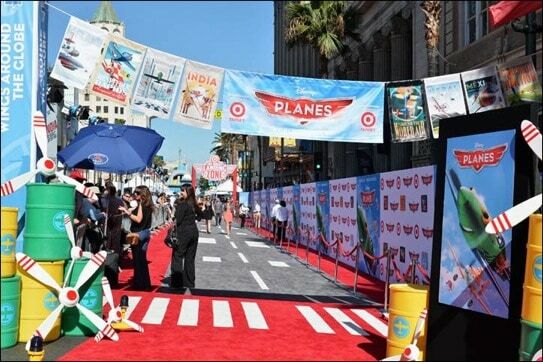 On August 5th the streets around the historic El Capitan Theatre were blocked off and crowds of people were gathered with cameras and video recorders, hoping to forever capture the excitement and energy surrounding the red carpet premiere of Disney’s Planes. 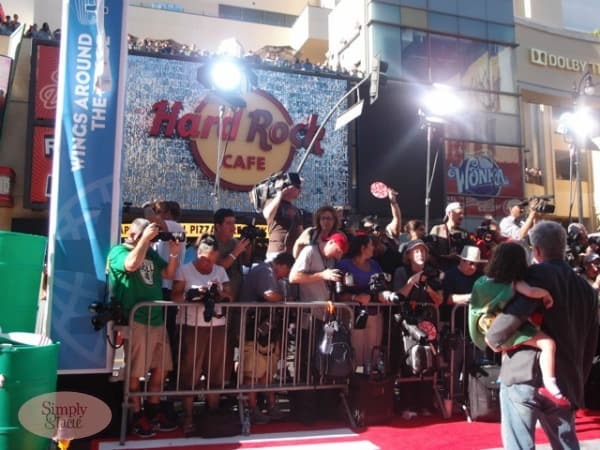 Our walk down the side of the red carpet was timed perfectly; we saw John Lasseter (the chief creative officer of Pixar) exiting his vehicle and Teri Hatcher posing for the media on the red carpet. As a once-devoted fan of Desperate Housewives, I was so excited to see Teri in person. She was very personable with her fans and even posed for pictures with a few of the bloggers in our group. I don’t know how I missed my chance; where was I when all of that was happening? Once away from the bright flashes the cameras, we wandered past the race-themed carpet and into the pre-party where booths of complimentary food and drinks were set up. Employees walked around handing out water, apple slices, and samples of Jamba Juice beverages. I was too immersed in people watching to consider eating or drinking anything! Our first celebrity sighting was Hilary Duff, star of the Disney Channel’s Lizzie Maguire. She looked stunning a casual black outfit. I was surprised to see a very familiar face–Dave Coulier of Full House. I had the pleasure of running into him in my hometown of Salt Lake City and certainly didn’t expect to see him at the Disney Planes premiere. A few people were shocked I’d recognized him since he was wearing sunglasses and looked inconspicuous. He was kind enough to pose for a picture with us. Anyone who is a Twilight fan is going to be extremely jealous that we met Peter Facinelli. He was extremely personable, complimented us on our dresses, and stood around chatting with us for a few minutes while his kids waited in line to play games. Here’s where I have to admit I’m not a Twilight fan, even though I’ve read all of the books. I’ve seen only one of the movies, and didn’t really have any interest in watching the rest of the movies. He was incredibly sweet, though, and I’ll probably be checking out his other films and TV credits. I played a few of the games myself, and won some fun Planes merchandise to take home to my daughter. I won an adorable Planes hoodie, but it was a size 3T so I gave it to a Los Angeles friend to give to her nephew. I hope he enjoys it! Just as we were all getting roasted from the hot sun, the party was coming to an end and it was time to file into the theatre, check our cameras, turn off our cellphones, and enjoy Planes, which will be officially in theaters August 9th, 2013. 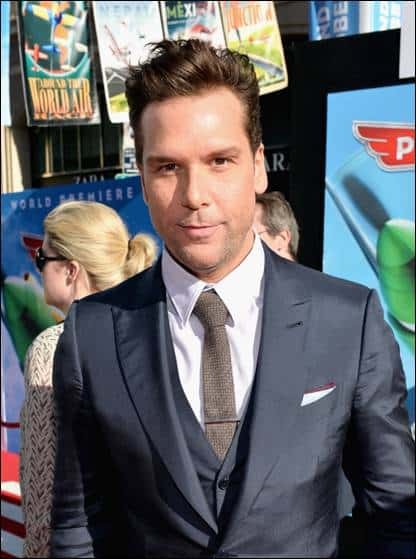 Check out the official Disney photos of the celebrity attendees for Planes! Now that, looks like a GREAT time!!!! How exciting! Great pictures, must have been an amazing experience !! Wow. That’s so cool that you were able to experience that! I love the look that the littles is giving you in the last photo. So funny. These are really awesome pictures of all the actors that are in this movie. 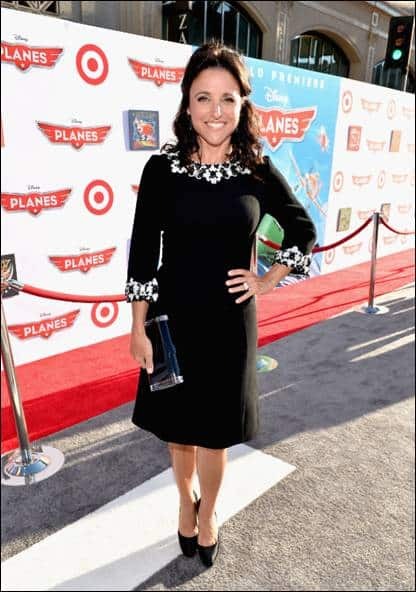 I think that Disney’s Plane is a terrific family movie, and I have been down there where this Premiere was and I would have loved to be there! Reminds me of when I lived in Hollywood, always a hoot! I can’t wait to see this with my boys this weekend! Did we have FUN or what?! Great meeting you Jen! Wow – great pics. Teri Hatcher really looks like a movie star, doesn’t she? How neat you were able to attend! So lucky this sounded like an amazing trip! My son wants to see this movie so bad. I have to laugh that I didn’t recognize some of these stars until after the fact…but I did have a blast hanging with your rock-star self. 🙂 You made the trip tons of fun! Oh this sounds like so much fun! And I love that the food you got was so healthy and child-appropriate – says something about Disney, I guess. Cannot wait to see the movie! It was great meeting you and a trip of a lifetime!! sounds like you had a awesome time! Great photos and great recap! It really was such an amazing time! Wow what an experience! Sounds like you had a great time! I am looking forward to seeing this movie myself. What a memorable time you had. You are probably still a giggly inside. Really enjoyed this post and the photos! Thank you for sharing! Great post. I had so much fun there and glad I met you!! This is one trip I will never forget. Going to see it soon! I see the photo credits, but the labels of who’s who in the pictures must have gotten eaten by the layout monster! Looks like you had an amazing time! Will have to take my kids to see this movie as it looks awesome! WOW! How cool is that! Love the fabulous pics! Sounds like you had a fantastic time! I am so envious! 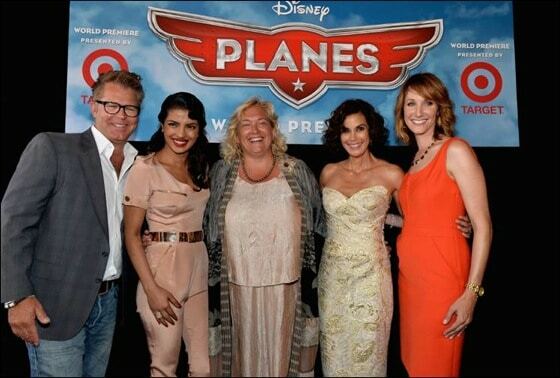 Wow, lucky you to be able to experience the Planes premier!! Did you get to talk to some of the celebs you saw? Great pictures. So glad you had a good time! How exciting is that going to a red carpet event!! I am so jealous 🙂 What an amazing opportunity! Wow looks like you had an awesome time, must be great to attend a movie premiere in Hollywood. My family look forward to seeing the movie Planes! What a fantastic opportunity! 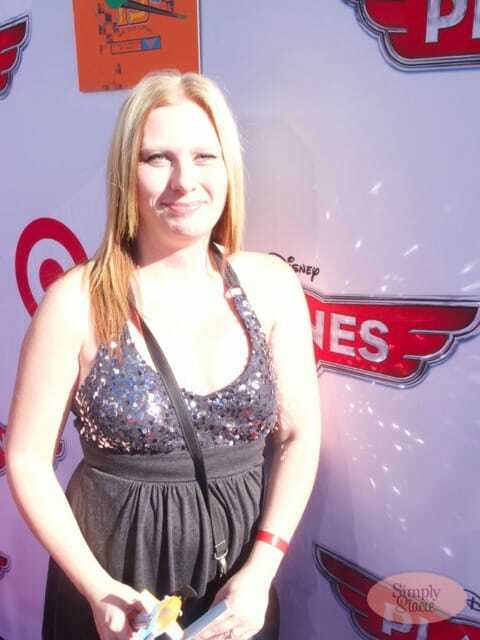 Love the red carpet set up! Everyone looks all dressed up and elegant and then you talk about them being personable and complimenting you. I love that! What a wonderful experience! My son saw this movie last weekend and loved it! That sounds like so much fun. My little guy hasn’t sat through a whole movie yet – maybe we’ll try this one! How exciting that you were able to attend this premiere!